2. Beat in butter or margarine, egg, vanilla and warm water with electric mixer on medium speed until just combined. 3. 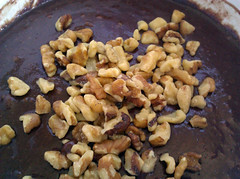 Stir in 1/4 cup chocolate chips and/or 1/4 cup chopped walnuts or pecans (optional). 4. Spread batter in prepared pan and bake for 20-25 minutes or until toothpick inserted in center comes out clean. Cool brownies thoroughly. Cut and serve. Makes 16 brownies. *You can use 1/4 cup Applesauce or blended Silken Tofu as an egg replacement. 5. FUDGE TOPPING 1-14 oz. can sweetened Condensed Milk, 1.5 tsp. Vanilla Extract, 12 oz. Chocolate Chips When your brownies are nearly done, combine all topping ingredients in heavy saucepan over low heat until chocolate chips are melted. Remove from heat. 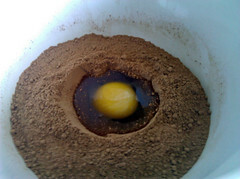 Spread mixture over warm brownies. 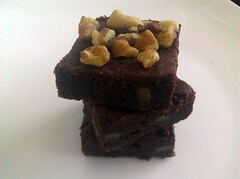 Allow brownies to cool and then cut into bars. 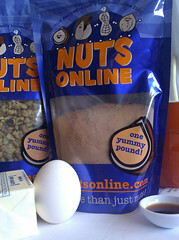 There are approximately 2 1/4 cups per pound. A deep and intense dark chocolate flavor combined with a wonderfully moist cake texture makes gluten-free brownies made from our Brownie Mix an instant favorite. A must for all chocolate lovers!